Wow....the year is almost over ! It is difficult to believe that i have not posted since June. Time just got away from me. The mill & knitting studio has been constantly working...even over the Summer months when it was hot, i was still selling knitwear & yarns. I'm not complaining as there is so much unemployment about i feel blessed ! I'm not one for making New years resolutions so i wont bother, but i really hope in 2017 i can find the time to post more often(monthly would be good) & host these little giveaways starting now. My biggest seller in Shetland knitwear are my large neck warmers. Over the Summer i improved the design somewhat & sold all but 1 in the run upto Christmas. you guessed it, I'm giving away a neck warmer. This one(will try to get a good picture, today it's too gloomy) is in the Musket Shade. All Natural & for domestic wool, it's very soft ! It's long enough to cover your head & neck. The button hole closure is smaller & more discreet with a deeper side opening for those who prefer to wear it puddled down around the neck. It sits lovely on the shoulders & is as near perfect as can be. Both ends are finished in double moss stitch. 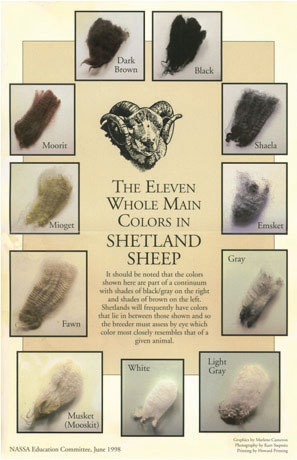 To enter this giveaway all you need do is tell me in the comments section what is your favourite shade of Natural Shetland wool ! Click on the picture above to enlarge. One winner drawn at Random. Open to everyone world wide. I love the emsket color! I like the white just like the snow.!! The emsket really caught my eye, but they're all lovely! Moorit, looks like it has quite a depth of colouring! love it! Merry Christmas! I love the shaela. Thank you!! I really like moorit! Merry Christmas! Emsket for me! And Merry Christmas to you too! And a very joyful Christmas to you too, and a blessed new year. The Emsket is beautiful! Yes, Merry Christmas! I love "basic black." Shaela and Happy New Year! I love the Emsket. Merry Christmas! I like the moorit. Thanks for doing the giveaway! I like the emsket! Merry Christmas! Happy Holidays and Happy, healthy 2017! Happy Holidays... I love musket. The Mioget is by far my favorite colorway! 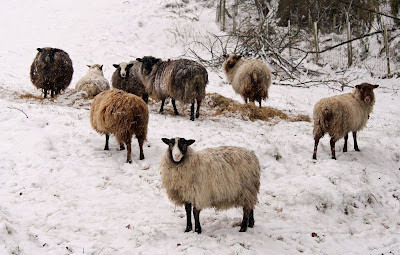 They are all lovely by my very favorite is Moorit! Fawn is really pretty, but they all are :) Thanks for the opportunity, happy holidays! hello Mindy, you won the Shetland Neck warmer....Happy New Year ! Moorit is a lovely colour. Merry Christmas and Happy New Year! I love the dark brown. Merry Christmas to you!! Hi! My favourite is the white. I love the beautiful Shetland shawls that women wore as wedding veils. They are like a delicate snowflakes held together with gossamer threads. Happy New Year! I like the white. It goes with everything.